Although, Santa Claus now resides in Oxnard, CA, for 52 years he lived at Santa Claus Lane in Carpinteria along with his pal Frosty the Snowman and an entire Christmas themed street! This eighteen foot tall Santa Claus found in Oxnard, CA just off of Highway 101 (take the Santa Clara exit if going North or the Rice Road exit if going South) use to be located on Santa Claus Lane just south of Santa Barbara in Carpinteria. The juice stand located on Santa Claus Lane was started by June and Patrick McKeon. With Santa Claus perched over their business, it evolved from nuts, fruit, olives, and dates into the Christmas themed attraction that it was for many many years. Santa resided in the chimney atop Santa's Candy Kitchen for fifty-two years. However, wear and tear eventually made it unstable and hazardous to have it perched on top of the buildings there. It was taken down in March 2002. Luckily, it was saved by several citizens and transferred South to Oxnard in January 2003. It was repaired and repainted, and placed in its current spot in Oxnard, looking west over Highway 101. Approximately three hundred people attended his re-dedication at the new site. Santa Claus behind the "S"
Santa Claus through the "C"
Santa's old home, Santa Claus Lane, has mostly been re-themed into sorta a New England style fishing village, the only reminder of the prior Christmas themed attractions being the name. Along with Santa, Frosty the Snowman stood at Santa Claus Lane, just a few building rooftops south of Santa. Additionally the village at one time had a train that kids could take rides on around the area. There was a toy store along with the candy store, and a restaurant named the Reindeer Room. 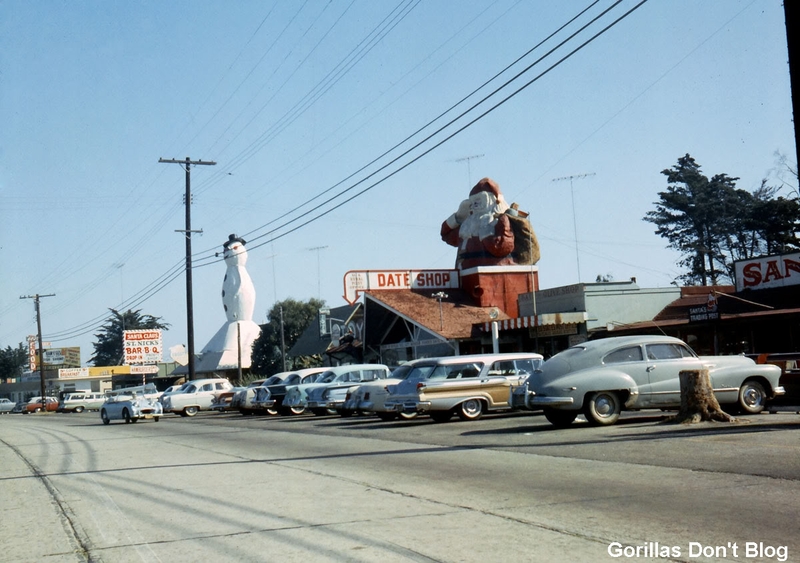 To the right, you can see a picture circa 1960, courtesy of David at Gorillas Don't Blog, that shows both Santa and Frosty proudly watching over the street. Frosty's eyes supposedly lit up and his pipe may have had smoke waft out of it. He was taken down in the 1980s, acquired by Tom Merkel, and relocated out to Maricopa, CA to join Tom's extensive collection of cars in his Lost Highway Car Garden. Today, Santa has acquired a few friends including a reindeer, a snowman with a surf board, and two flanking toy soldiers. His sleigh is off to the right behind him. Santa and his entourage hang out behind green gates, with the letters, "S", and "C" on the front. Santa Claus also now has corporate sponsorship in order to assist in his maintenance costs, and received a brand new paint job as a result. He also wears shades in the summer to protect his eyes from the California Sun. In December a half marathon called "Santa to the Sea" takes place, with the course starting at Santa and making its way to the ocean. The race often has lots of runners dressed up in Christmas themed costumes. I stopped there once in 1988 or so and had a date shake. Does anyone have the recipe? Haven’t found any date shake as good since! @Anonymous, Valerie is well and living in the Coachella Valley. Linda is a friend of mine. She lives in La Quinta. Ruth passed away from pneumonia after hip surgery due to a fall around October 2007. She was 93. I just learned that my Grandfather, Ken Provost was the original owner of the Date Shop! That is so wonderful! I wished I had gotten the chance to visit the shop, but was not born then! I have heard alot of good things about this shop! One lady comentated about valarie the owners daughter of santa claus villiage, im from fillmore calif and had stopped there many times driving back and frorth from vandenberg. I remember correctly Valarie live in Grove Oklahoma and i talked to here a number of times at a music store there that here huysband or boyfriend ran. Small world that i ran into here then i even rembember her dad. met valarie around 1990s I live in Grove for 17 years and met her a number of time. stopped at santa claus a few times with my children while i lived in ventura, ca. I had the best DATE shake I had ever tasted in 1967 on a visit with my family to Ventura, CA Sorry its not there any more. In the 1970's my dad used to have a big truck which he hauled fertilizer to the nurseries in Santa Barbara and areas all over southern California. Whenever I would go with him to Santa Barbara this would be our stop on the way back home. The little individual pies were the best ever. We always looked forward to stopping there and having dinner and a pie. Just like everything else, dads truck is long gone, dad has since passed and Santa Claus lane also has gone. I will always remember riding with dad in Ol Dude and those fantastic times. Thank you. THIS IS A BLAST FROM THE PAST. Not only did I live a few blocks away from Santa Claus Lane in a trailer park on Carpinteria Avenue. I could see Santa from my steps of my trailer. My mom worked at the Bakery, and would bring me with all the time to help. We made some amazing Baked Goods there. Napoleons were one of my favorites. Of course we made things with dates, and I always got a date shake on my break.. So many memories there of riding in the train with Santa Claus, and hanging out in the toy store, candy store, and eating ice cream.. I also remember a big gorilla in one of the stores. The only names I can remember are Hap and Ruth, and I think they had 2 daughters.. one was Valerie I think. I also remember Aunt Marion she was so sweet, and I think she was the one working with my mom in the bakery...I was like 11 when this all took place. I lived in the trailer park until 1975 , and went to Carpinteria HS for 3 yrs. Santa Claus Lane was just an amazing place to go play, and work...I loved the smell of the bakery, and Santa's Kitchen. We ate at the Reindeer Room all the time, and on my mom and my birthday they would make us Prime Rib for birthday dinner.my favorite.. I am glad that Santa is still standing but, I wish he was standing in Carpinteria somewhere... I wish I could remember more, however, I am going to talk to my mom, and see what she remembers, if anything..
My father and his brother built the large Santa Claus on Santa Claus lane, Carpinteria, CA. Here is the story about this structure and place: Santa Claus Lane was owned by Eugene Auger. He had two children, Penelope Auger and Loda Jean Auger. He created Santa Claus Lane in the years 1945-1950 in an effort to create a theme-like playland like Disneyland. He would welcome people with a hearty “Welcome to Santa Clause. Ho, Ho, Ho!” and then each person would get a sucker. One time a child wanted to get another sucker after the first one. He cried and cried and Mr. Auger said, “You only get one, kid.” Santa Claus playland had a alligator pond and a little train that went around the small park. One time Mr. Auger accidentally fell into the pond and the alligators jumped out and ran away because they got scared. Never were they seen again. Pat McKeon, a big fat handyman, was hired by Auger to design the giant Santa Claus to be placed at the top of the main store so that people driving down Highway 101 could immediately see the playland and stop there. McKeon hired two teenage brothers, Gene and Leonard Ainsworth to build the supersized Santa Clause. They worked on the Santa Claus for four years and then placed it at the top of the main store and he sat there for more than 50 years. Santa Claus was taken down in the 1990s, thus ending the dream of Santa Claus playland. Whatever happened to Valerie daughter of the owners of Santa Claus village near Carpenteria? In 1958/59 I lived in Santa Barbara and Valerie and I were good friends and used to drive to Santa Claus and sit and drink cokes. The rooftop structure was scheduled for demolition because the then-current owner wanted to change the theme of the restaurant - even change the name of Santa Claus Lane - for new commercial development. The Pearl Chase Society, Santa Barbara's main historic preservation organization, mounted a public campaign and funds to relocate Santa to Nyeland Acres near Oxnard. It was quite a spectacle that day as the huge flatbed truck moved slowly down the freeway. Now Santa is a focal point for that community with events at Christmas and throughout the year. Frosty is alive and well in Maricopa, CA at Tom Merkel's Cuyama Car Garden. We lived in Ventura as kids and loved to go there. My dad loved the date shakes and we loved the toy store and the candy shop..loved the train too. I was lucky enough to take my children there before it was dismantled.. makes me sad but glad to know Santa has a new home.. Next time I am in the area, I will look for him.. my Granddaughter did not get to see SantaClaus...sad that nothing ever stays the same.. If I recall the snowman blew down during a big wind storm. My grandfather built the snowman (twice! The first one was destroyed in a windstorm). He and my grandmother, Bob and Maxa Roberts, owned and ran both the Frosty beneath the snowman as well as the small attached hotel. Their son, Steve, (deceased) worked in the Frosty, as well as driving the train. I "worked" at the petting zoo on the lane for a bit, taking charge of the baby llama, Pepsi. I remember the toy store run by Wanda, the pottery store right next to the hotel, and the Reindeer restaurant. Great times and a great place to spend summers. I think there is a town of North Pole somewhere along the Dempster Highway in Alaska. I used to live in carpenteria.and remember thst dearly.there wad a resturant that also served hotcake with santa stamped butter.I also have fond.memories of the wagon well.is..that still there.with an ajouned..I think 2.or 4 lane bowling alley.those were the days ! Grew up in Venice, California my dad, who was a WWII veteran, loved to drive both north and south along the coast. Many trips to Santa Claus and my sister and I would never fail to get a ride on the train. Does anyone know what happened to the train? I used to play at the piano bar in the Reindeer Room. I loved that place and loved working for Hap and Ruth. My Dad, John Milroy, flipped burgers, after returning from WWII, at the Snowman Cafe" that was owned by Bob and Maxa Roberts. My mother, Bonita Auger, was the daughter of Eugene T. Auger who lived in the last house on the North end. My wife and I used to work at the polo fields in Carpenteria in the early 1970's. We often started our morning after exercising the horses with breakfast at Santa's Kitchen. Best eggs benedict, to die for. I was priviliged to experience living in San Luis Obispo. On visits to and from LA the sight of Santa Claus and the occassional stop are one of many happy memories! This was one of my favorite places in my life. I use to buy a cookie cutter everytime I was there. Use to get the Texas sheet cake, made fabulously. But....even the rest rooms are memorable. They were terrible !! But they even add a touch of nostalgia to my memory of the wonderful stops there. I was nearly traumatized when I drove through there and Santa wasn't there. Loved the Lane so much. Grew up in Moorpark, CA and had family in Lompoc, so the family made many many road trips always stopping at Santa Claus Lane. Fond memories of riding the train, shakes, and toys. Also remember looking at all the lobsters that lived under Frosty's protection at the end of the lane. By the way, it's still a lovely place to stop if you are driving by, fun food places and a great ocean view. Does anyone know what became of the carousel that was in the back? Sorry to inform you lady of Eureka but Santa Clause lane is not a town. The truth is the only town to be named after the jolly Saint Nick is back east and Santa Clause lane is in Carpinteria Ca. I rode the train often and loved to eat breakfast there! Growing up in Carp. Allowed me the privledge of visiting the candy store many times and enjoying the company of both Frosty and Santa. Nice to see that Santa is still around but I sure do miss him and his ocean side home. i would like to find some of the staff that worked at the resturant for Hap and Ruth.. I first posted here in 2007 and when I googled Danny McKeon Carpenteria I came back to the site! There were two Danny's - on cousin Danny, Pat's son, and one who posted, one of our many second cousins from Utah and California. How great to read I am not alone in my fond memories of angelic scents like divinity and fudge! There was so much love in those businesses - really from the lady who ran the toy shop to the folks with the cafe, every person doing Christmas year round recognized the underlying principle that to every child who wondered "is Santa real" then this little spot off the highway kind of proved it. So there was this element of believing it must be true and the expression of year round faith in the Santa myth - expressed with cookies, candy, specially cool toys, and date shakes - it was really a part of that fun. One great memory was Aunt Mereon letting me and cousin Jeanelle go into the candy shop to make any kind of ice cream sundae we wanted, no questions asked. For a six year old with eyes bigger than my stomach, it was a culinary epiphany. Chocolate and pineapple sauce with ice cream and other toppings really was not as good as vanilla ice cream and hot fudge. But it was so fun to get to build my own Sunday behind a counter and eat it in the dark with my giggling cousin. I remember many wonderful and exciting visits from whittier,California to Santa Barbara to visit our family (My Father Jack B.McKeons first cousins) at "Santa Claus Lane". Our lovely Aunt Mereon was a saint and was always so kind and loving to see us and was the best baker,cook and candymaker. Uncle Pat was always happy and joyful to see us and gave us kids unlimited rides on the small scale train,which ran in and out of the building he had constructed. It was so fun and exciting as a child.I loved going there. Santa was built by Kenneth Vaugn with the assistance of his daughter Joyce who carried endless buckets of plaster up a ladder. Joyce lives in Ridgeville Indiana and is having her 80th birthday on October 1, 2011. Kenneth was a sign maker and graphic artist. He liked to travel and would approach business owners with propositions to make signs to fund his travels all over the United States. It is great to see Santa has been restored. Thank you. @ Anonymous-YES this is progress because thanks to those Oxnard residents, he is alive and well. Glasses and all. I grew up in Carpinteria and now live in Oxnard and I love to tell people how he was in the town I grew up in and how lucky I am that he is now in the town I live in. I grew up in southern California and remember Santa Claus Lane well. I have a vague recollection of the snowman as well a Reindeer Room Lounge. I remember making a couple of spontaneous road trips with friends from LA to SC Lane just to get a date shake! I took my kids to Candy Kitchen a few years ago before everything was dismantled...it saddens me to think that when I used to make the drive from UCSB to LA, it was just something I took for granted..I'm happy that Santa was saved! The white 'Taj Mahal' house behind the old Santa's Kitchen is still there. I remember the snowman well. It was made of sheet metal pieces riveted together and painted white. Must admit he was a bit creepy, and looked nothing like Santa. I liked him all the same and was sad when he was removed. Sadder still when Santa was taken away, and the whole character of Santa Claus Lane lost forever. But I'm happy to hear that Santa is alive and well, and living the good life in Oxnard. Yes, the owners were Hap and Ruth. The other daughter (besides Linda) is named Valerie. My family used to drive past what we called, "Santa Claus Lane," heading up north from the San Fernando Valley (LA County) when I was a little girl (during the 60s.) I always wanted to go there but my parents would never stop. So about 20 years ago I decided to drive up there with my own daughters. There were several coin operated rides, a candy shop and toy store we would enjoy for an afternoon every December. Once we even ran into a dude dressed like Santa. So my children were really excited. I was sad to see the Santa Statue disappeared on my way to Santa Barbara one day. But I was really happy to see Santa relocated right near my Bible College hear in Oxnard, where I live. I would have been sad to see him gone forever, although we still miss Santa's Lane. The man who saved him and fixed him up built him a nice little garden area with the help of some boy scouts and other neighbors. It's really a sweet story and not ghetto at all. And though many have complained about his sunglasses, apparently they come off for some part of the year leaving his original style glasses. The new owners also spiffed him up. Now they want people to use the location for charities to give gifts and stuff. So I like him in Oxnard (Nyland Acres.) I hope he is here to stay. Frosty did reside atop the buildings on Santa Claus Lane in Carpenteria and was removed in the late 1980s or early 90s. It was there when I moved here in 1985! I loved Santa Claus Lane. My mom would take my sister and I there on our way to Sears in Ventura to buy school cloths. There was a snowman, and I loved riding on the train. I was about 7 years old first time I went. I wish it were still there. My daughter goes to college in Santa Barbara and I wish she could visit it. I've told her all about it many times!!! Sad to know it is gone. I have fond memories of staying there with my Aunt Mereon Provost in the back of the shop there was a house connected to the shop we use to visit her this was after my Uncle Ken provost Passed away in the 60's use to hear the train roll by all the time because it was right behind the house. I use to love the date shakes and oatmeal cookies she use to make there also remember the peanut brittle was so good!!! I miss my Aunt she the nicest person you could meet. I also remember collecting the glass electric pole insulators the they would just discard there. Also next door use to love the giant stuffed gorilla and dinosaur that was in the toy store next to the shop. There was a snowman at one time but it was removed many years before Santa. There also used to be a train that would take kids for a ride around the site. I too remember fondly driving by Santa Claus Lane and seeing Santa, he snowman along with Santa's sleigh and reindeer. Never got the chance to visit, but while obsessing over the snowman and reindeer I did find out that the snowman was bought and taken to New Cuyama, CA and rests at a car garden. I'm still curious to find out what happened to the sleigh and the reindeer. I was fortune enough to find pictures of what I remember at the Carpinteria Valley Museum of History. They did a great job of documenting our memories. Kudos to the Museum! My husband and I were just watching a show on television that said that the only town in the world called Santa Claus was back east somewhere. I went, 'nope' and researched and came up with your site proving that I was not insane. I travelled past it many times as a child and remember the snowman, as well. I hope that someone can find a picture of it. It was there between 1973 and 1975, at least. Merry Christmas, everyone. I remember the smell of the ginger bread cookies and especially that wonderful train already mentioned. It went around back of the buildings and you could smell that metallic ocean smell and the granite rocks of beside the real train tracks. This was also the first place I ever saw pay toilets, but given its location it was the only place to stop for the kids to go if you were going from Ventura to Santa Barbara. Ok, so I'm not crazy, b/c I remember their being a Snowman too. I've searched for a picture showing both Santa & Snowman but can't find one. My grandparents use to pick me up in Santa Barbara on the way back down to Camarillo and we always stoped off to ride the train and have a burger. Great Memories! I was in my teens back in the mid to late 50's, and my parents would often drive to what was then called Santa Clause (now Carpenteria). The gift shop was my favorite place to visit while my parents rented a room at the Motel at the south end of the street. We would often peer over the fence at a house that resembled the Taj Mahal which had partially crumbled into the ocean. My wife and I stopped there last year and I couldn't believe what I saw. The 'Taj Mahal' house was completely gone and what was left of the Motel, shops and restaurants were unrecognizable plus the huge Santa on the roof was gone. we went past there on our way home but I just couldn't bear to stop again. I guess you really can't go back. I remember Santa's Kitchen, I worked there with my Dad back in thelate 70's I was a busboy and my dad was a Waiter. During that time Hap and his wife owned it and operated it. They had to daughters that worked there. Linda was one of his daghters name dont remember the other. I was aroung 15 and they wanted to make me a waiter. Yes, there was a Snowman atop a burger and ice cream cafe south of the Date Shop. I think it was called, well, the Snowman. I remember running around with my buddy Stevie who I think was the owner's son. My grandmother, Dee, owned and operated Santa's Trading Post. I obviously loved the place, living there as a kid in 1959-60. My Uncle Pat McKeon and his wife June started Santa Claus with my dad Richard, Uncle Gilbert, and my Aunts Mereon Provost and Kathryn Lind. None of them were from Ohio but all the McKeons involved were born in Milford Utah. A fascinating (to me!) Legal case, McKeon vs. Santa Claus, is available on my website. www.merrittfamilylaw.com in the download section. As far as I know I am the only attorney whose uncle sued Santa Claus and won. My aunts and uncles and dad are making divinity candy in heaven now but I did want to correct the record. Yes frosty used to be up there too and there was an awesome train that went around the village. I will try to find pics. I loved this place and miss it ALOT.